A stunning literary mystery set between 1938 New York and 1986 Brisbane. Standing in line for an exhibit on the life and work of novelist, Inga Karlsson, Caddie Walker meets a woman who seems to know more than is possible to know about Karlsson’s famous lost work. Caddie begins a quest for answers- who is this woman? What is her connection to Inga? And does she know who murdered Inga and her publisher all those years ago? Her research leads her to Jamie Ganivet, a rare books dealer who gave up on Karlsson scholarship after a run in with Professor Philip Carmichael, who just happens to be Caddie’s ex boyfriend. Told in alternating chapters, including Caddie’s present and Inga’s past, The Fragments is a fascinating mystery that defies genre, and will delight book lovers everywhere. Toni Jordan is one of my favourite authors of all time. I remember my Mum coming home one day in 2008 (my final year of high school, and the year I began seriously 'working on my novel') and she told me that she'd heard an author interviewed on the radio. She said the book sounded interesting, and she thought I might like it. This is something that my Mum does, by the way. In fact, all of my family does it. Anything writing related, they tell me about it. They keep clippings from papers, and they send me links to podcasts. If it's writing related, it's sent my way, and it's really very sweet. But that day, the book in question was Addition, the first book by Toni Jordan. She bought me a copy not long after, or perhaps I bought one for myself (but more likely she did I think), and I read it. I thought it was wonderful. It wasn't until Nine Days came out four years later, though, that Toni Jordan became one of my favourite authors. I thought to myself reading that book, here is an author who can write history. It feels real and it's not too fluffy or overly romanticised. She just gets it. 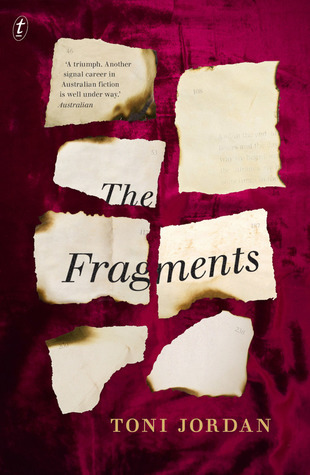 The Fragments is Toni Jordan's fifth book, but it's a pretty close second for my favourite of all her works. It has a bit of everything I like-- the 1930s, publishing, a mystery, a missing manuscript, a bookshop or two, and a love interest with an interest in old and rare manuscripts. For the entire time that I was reading this book, I was transported. I could feel the Brisbane heat. My only complaint is that the book was not longer, but isn't that the quote? If a book is well written, it is always too short? I can't wait to see what Toni Jordan will turn her hand to next. I am sure it too will be surprising and delightful.